You are here: Home / Careers advice / Which CV template should I choose? The internet is rife with free CV templates – offered by websites that either make their money advertising or use the opportunity to peddle their paid services. That’s good news for jobseekers because there’s plenty to choose from. But which CV template should you choose? The type of role you’re applying for can influence which CV template is right for you. For manual, administrative or professional roles, a basic CV template with a simple layout, a standard font and few or no graphical elements will be most appropriate. Your CV does need to stand out from the pile but this should be because of the information it contains, not because of gimmicky graphics or gaudy colours. If you’re applying for a creative role, it makes sense to choose a CV template that shows creative flair. Creative fonts, colours and graphical elements will help to showcase your ability. Our creative CV templates will be a good place to start – don’t forget to download the correct fonts so that the template renders properly in Word. However, at the same time, it will be important for the prospective employer to find and understand the information on your CV quickly. Fonts must be legible and layouts should not detract from your information. If you’ve spotted a CV template that you like and it has an unusual font, you’ll probably need to download and install the font file when grabbing the template. Usually, this is as simple as downloading the font file, opening it and clicking ‘Install’. This adds the font across all your programmes that use fonts such as Microsoft Word or Photoshop. However, for all roles besides creative, using a fancy font is frowned upon. Check out our guide to choosing the best CV font here. If therefore your choice of CV template has a fancy font and you’re not going for a creative role, you can just switch it to one of the recommended choices such as Helvetica or Garamond. Avoid unprofessional fonts such as Comic Sans or Calibri. In Microsoft Word, to switch the font for the entire CV, choose SELECT > SELECT ALL from the Home tab, then simply change the font to your choice on the drop down. A little colour can help with the presentation of your CV by breaking up your information. You can safely use colour for dividing lines and headings regardless of the role that you’re applying for, but unless you’re going for a creative role, it’s best not to overdo it. Consider your choice of colours too – some colours look ‘classic’, such as soft green, while other colours look bright and gaudy and will only work if you’re applying for a fun job such as working at a play area. ‘Graphics’ has quite a wide meaning – some people take it to mean any element that isn’t text, while others would interpret it to mean photos and clipart. Subtle boxes used to divide up the space work just fine on a professional CV. However, some elements can be over-the-top for a professional role, such as this ‘person’ background on our light purple creative CV. This would work just fine for a marketing role but looks too gimmicky for administration or management. 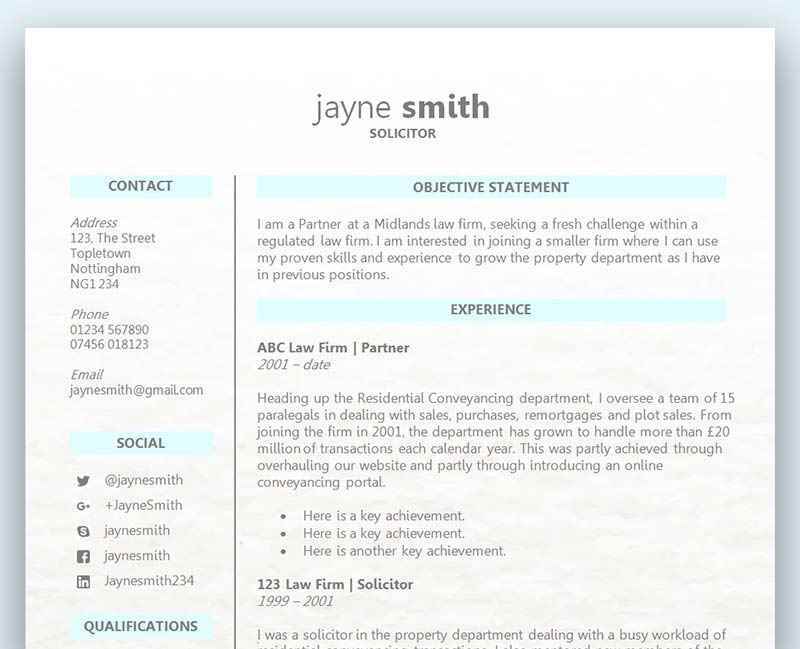 Browse our collection of free CV templates in Microsoft Word and find your perfect CV today! Should I include a CV photo?